Raymond Dexter Moulton, a World War II Veteran of the United States Army, died early Monday morning, October 25, 2010 at The Meadows of Edgewood in North Andover. Ray was born in Peabody, Massachusetts on December 5, 1923, the youngest of 8 children of the late Grace (Phalen) and Arthur Moulton. Ray married Kay Martha Webster of Newburyport on January 6, 1953. They have five children, Cathy Rae Moulton of East Kingston, NH; David Webster Moulton of Newbury; John Russell Moulton of Kensington, NH; and Martha Anne Dudley and Elizabeth Ruth Cowie, both of Newbury . They also have six grandchildren and three great-grandchildren. 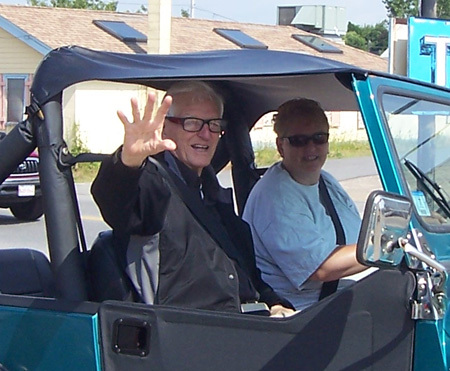 Ray and Kay opened Surfland Bait and Tackle on Plum Island in 1960, which is still run by Kay, Martha and Liz. Ray co-founded 3R Marina in 1973 on the Merrimac River behind Webster’s Riverside Dairy in Newburyport. Ray, with his two sons, David and John, opened Riverfront Marine Sports in Salisbury and Newbury in 1978. 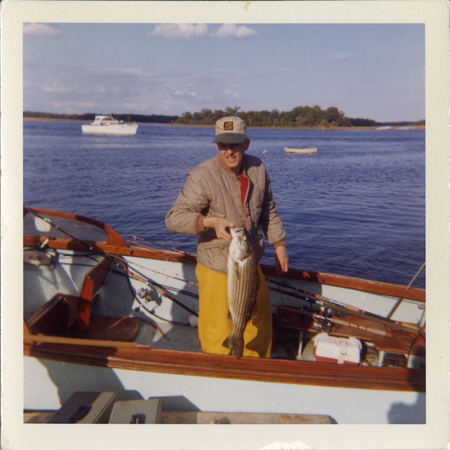 An avid fisherman, Ray was fondly known on the Merrimac as the Grey Ghost. He was immortalized in the radio fishing report by Mickey Villane as “Sleepy-Eye Moulton”, being out all night fishing. Ray was also an avid golfer during his retirement and lover of all animals. He was also known to play a few hands of cards. Private funeral services for Ray will be held at Elliott, Woodworth & Rogers Family Funeral Home, 35 Green Street, Newburyport. In lieu of flowers, please make donations in his memory to the Salvation Army, 40 Water Street, Newburyport or to the MSPCA, 400 Broadway, Route 28, Methuen, MA 01844. A reception for friends of the family will be held Sunday, October 31, 2010 at 2 P.M. at the PITA Hall on Plum Island. I had to smile a little bit after reading Ray’s obituary.I haven’t heard the name the Grey Ghost or Mickey Villane in years and this brought back some fond memories of Plum Island from my youth.Back then the Striped Bass Derby was the main event on the Island every summer and Surfland and the Beachcomber were the places to be to follow the everyday action.It seemed like everyone that stayed on the island was involved in the Derby and the competion was fierce. Ray’s passing is just another reminder of the old Plum Island that I miss so much.Rest in Peace Grey Ghost.